The first building to be completed at Vassar’s founding was long called, after its famous first inhabitant, the Maria Mitchell Observatory. The celebrated astronomer made the building of an observatory, including living quarters for herself and her father, a condition of her joining Vassar’s first faculty. Accordingly, Charles S. Farrar, who later became Vassar’s first professor of mathematics, chemistry, and physics, was commissioned to design a unique facility that would combine suitable research resources with space for teaching and appropriate residential accommodations. In material—brick with stone—as well as in its proportions and design elements—arched first floor windows, brick pilasters at the corners, a central entrance at the second story—Farrar’s building faithfully echoed, in miniature, Renwick’s enormous Main Building. An octagonal center, twenty-six feet in diameter, supported the dome, twenty-seven feet seven inches in diameter. Three two-story wings to the north, east, and south, twenty-one by twenty-eight feet, contained on the second story a “prime vertical room,” a “transit room,” and a “clock and chronograph room”—each named for its instruments and functions. The first stories of the wings, unfinished at first, were nine feet high, but the second story floor of the octagon was four and a half feet above those of the wings. The walls of the octagon were made with solid brick for stability, and the walls of the wings were hollow. The dome was built with ribs of pine resting on a plate of pine and was covered with sheet-tin. Sixteen cast-iron pulleys, nine inches in diameter and running on a track of iron, revolved the ton-and-a-hall dome. William Harloe was the builder of the Observatory and of Main. To stabilize the instruments, Farrar called for five stone piers, spanning the basements and the principal floors, each unconnected to the walls and floors of the building so as to be "immovable by wind or any mechanical force." A granite shaft rested on the most massive pier to hold the equatorial, with similar shafts for the transit and meridian circle of Onondaga limestone, and for the prime vertical of white Westchester marble. The bases of the clock and chronograph were of Dover marble. Excellent as the research and teaching facilities were when the Observatory opened, the domestic arrangements disappointed Mitchell. She and her father moved into the rather unfinished north wing in 1865, and as the year went along she wrote to the new college’s supervisor: "Will you, in our absence, have the goodness to look into the Observatory and see if some arrangements can be made for greater domestic comfort?" And, in the summer of 1866, she implored, "Can you do something before my return to make the basement room of the Observatory more presentable?" Improvements were evidently made; she continued to live in the building—the only member of the original nine faculty members not resident in Main—and inaugurated there the tradition, still in force, of “Dome Parties,” social gatherings where her devoted, able, and industrious students could meet distinguished visitors, play at charades, and recite original poetry. The founder himself took particular interest in the recruitment of Mitchell to his faculty and in the preparation of her building. He involved himself personally in the acquisition, in 1863, of a telescope for Mitchell. Built by Henry Fitz, a celebrated New York telescope-maker, the instrument, whose “object glass” measured twelve and three-eighths inches in diameter, was acquired through a third party, Matthew Vassar reported to the college trustees, for $2,000 less than its customary price: "the bargain was closed, the treasurer secured the prize, and the glass [was put] in the safe of the founder." Vassar also told the trustees that their new telescope was exceeded in size "only by the great equatorial at Cambridge University" [presumably Harvard]. 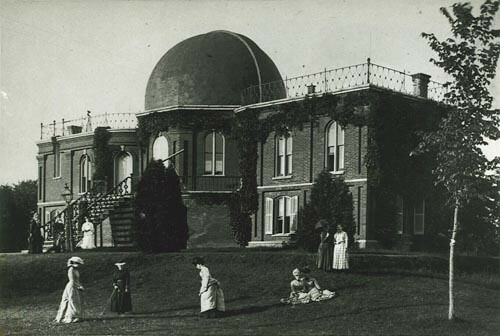 Mitchell continued to teach and do research in the Observatory until shortly before her death, in 1889, and the building fulfilled its original purpose for a century. In 1991, it became the second Vassar building (after Main in 1973) to be designated a National Historic Landmark. The citation on this occasion noted that the building, Mitchell’s “home, her laboratory, and her classroom for the last 20 years of her life,” was where “she inspired young women to think for themselves.” Astronomy continues at Vassar in the Class of 1951 Observatory (1997), and the Maria Mitchell Observatory—renovated and restored as the Judith Loeb Chiara '49 Center at the Maria Mitchell Observatory—serves as classroom and faculty office space for the Education Department and as the site of the office of the college historian. Daniels, Elizabeth. Main to Mudd and More. Poughkeepsie: Vassar College, 1996. 16-19. Van Lengen, Karen and Lisa Reilly. The Campus Guide: Vassar College. New York: Princeton Architectural Press, 2004. 106-8.